It’s amazingly easy to create share certificates in Inform Direct. 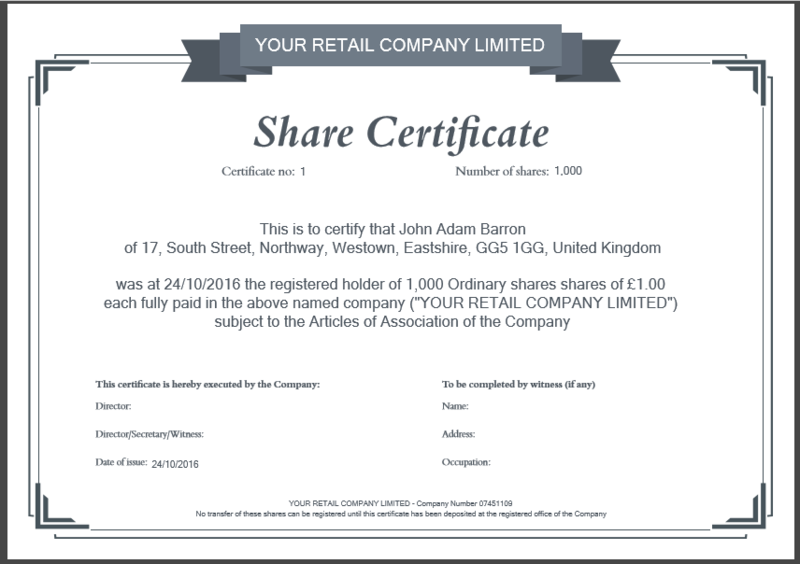 You can create branded, professional-looking certificates whenever you allot or transfer shares or reorganise a company’s share capital – or just create a share certificate for an existing shareholder. To save you time, all certificates are automatically populated with shareholder details that you’ve already entered or which have been retrieved from existing records at Companies House. Lots of people have asked us for more templates, so you can choose a style that’s perfect for you. So we’ve introduced another 5 professionally-designed templates, so you’ll be able to make your share certificates look even more special, helping companies impress their shareholders and accountants add even more value to their clients. Our standard share certificate template is – and will always be – completely free to use. And, as part of their simple monthly fee, Inform Direct subscribers get full access to the new share certificate templates for all of their companies. Other users can purchase a template – which you’ll then be able to use for as many certificates on as many companies as you choose – for just £5 + VAT. Using the new templates is really simple. When you come to create a share certificate, after choosing a certificate number you’ll be asked which template you’d like to use. Inform Direct remembers the template you used most recently for the company: so you can either stick with that selection or opt for a different template. As well as being instantly available to print, all the certificates you create are saved in your personal document library so you can always find them again later. If you don’t already use Inform Direct to produce share certificates the easy way, now is a great time to start! You’ll discover the easy way to create share certificates and a huge range of other useful company documents.